Welcome to Socotra, Socotra is a magical island where an ancient language is spoken and where endemic plants and animals continue to thrive in a pristine environment. The island is ideal for those visitors who have an interest in hiking, snorkeling, and bird watching. 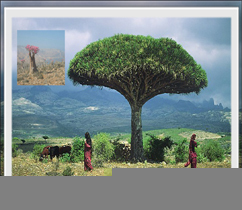 Socotra Island is an attractive natural landscape. God bestowed it with distinct bio-diversity rich in creatures and beautiful plants. These characteristics have rendered it one of the world's most important ecology islands and placed it at the top of the interests for GFF, which took up the responsibility of funding the biodiversity protection campaign and sustainability of the island's natural resources. The long geological isolation of the Socotra archipelago and its fierce heat and drought has combined to create a unique and spectacular endemic flora (which may therefore be vulnerable to introduced species such as goats and to climate change). Summerland Hotel is happy to welcome you! 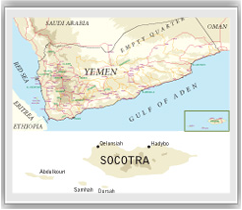 Our hotel is located in the Capital Of Socotra Hadibo.